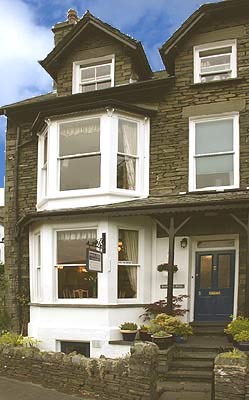 We are just two minutes walk up from the Ambleside village centre with all it’s shops, restaurants, pubs, galleries, cinema and other attractions in a quiet but convenient road with fantastic views over the village and Southern Fells. You can take many walks straight from the door. We have three luxury “boutique” style bedrooms all very individual with a mixture of modern classic furniture. All rooms have widescreen DVD Televisions, clock radios, hot drinks tray, hairdryers and are furnished with top quality linens and towels. Each has an individually designed bath or shower room with excellent toiletries and bathrobes. We try to make our breakfasts the very best. We have a wide choice including fish fruit and vegetarian/vegan options as well as the traditional English breakfast in a variety of choices. For example we use organic produce when appropriate and properly cured local bacon, butchers sausages vine tomatoes and free range eggs. Please note we are a non-smoking establishment. We regret we do not have accommodation for young children or dogs.